Book Note: “Religion” in Lisa Pine, ed., Life and Times in Nazi Germany (London: Bloomsbury Academic, 2016). Pp. xv + 307. ISBN: 9781474217927 (Paperback). Lisa Pine’s Life and Times in Nazi Germany brings together an interesting set of contributions on “the history of everyday life” in the Third Reich. 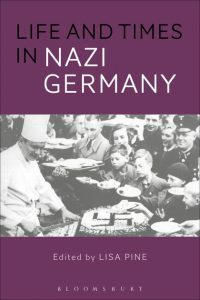 With three sections—“Food and Health,” “Lifestyle,” and “Religion”—she aims to assess “the extent to which a regime with totalitarian aims and ambitions succeeded in permeating different areas of social and cultural life in Germany” (15/357; all references are to the pdf electronic edition). Pine provides a thorough historiographical overview of the social history of Nazi Germany, then turns things over to her contributors. The section on “Religion” is the chief concern of this note, and is comprised of three chapters on Protestantism, Catholicism, and Christmas. Probst argues that most Protestants supported the Nazi state, whether eagerly or with mixed emotions, and that well before 1933, Protestantism was permeated with antisemitism and anti-Judaism. He develops these ideas through an overview of German Protestantism in the Third Reich and then a comparison of the views of two opposing Protestants towards Jews: Theodor Pauls, a historian and professor of religious studies who celebrated Luther’s antipathy towards Jews (adding a layer of Nazi racial antisemitism to the views of the reformer) and who worked to de-Judaize Christianity; and Heidelberg pastor Hermann Maas, a member of the Confessing Church and an ardent defender of “non-Aryan Christians” and Jews against anti-Judaism and Nazi persecution. Along the way, he draws on the work of Alon Confino (A World Without Jews: The Nazi Imagination from Persecution to Genocide) to establish the ubiquity of antisemitic sentiment among Germans, including Protestants, as the context within which clergy and theologians lived and worked. Overall, Probst focuses on explicating the range of Protestant opinions on Jews and Judaism, but says little about Protestant responses to Nazism or the pressures which split Protestantism into the competing factions of the Confessing Church and German Christian Movement, generating the church-political struggles that dominated Protestant life in the Third Reich. Kevin P. Spicer’s chapter, “Catholic Life under Hitler,” traces the difficult choices faced by German Catholics over four phases of their relationship with National Socialism: “(1) 1930-1933, when German bishops publicly opposed National Socialism; (2) 1933-1934, when the German bishops jointly reversed their stance towards National Socialism, while holding on to the delusion that they could work with the state; (3) 1934-1939, when the state directly attacked the Church’s value system and worked to remove it from the life of the Volksgemeinschaft (‘national community’); (4) 1939-1945, when the state, while threatening to blot out the Church as a matter of policy, engaged in an annihilative war that simultaneously carried out the murder of thousands of physically handicapped and mentally ill people, as well as the deportation and murder of millions of European Jews” (273/357). With memories of the nineteenth-century Kulturkampf in mind, Catholics worried about the danger of marginalizing themselves from the political mainstream through a rejection of Nazism. And besides, both Hitler’s promise that the churches would be foundational to his rule and the emerging economic recovery made the Nazi regime popular. The Centre Party’s support for the March 1933 Enabling Act and the July 1933 Concordat between the German state and the Vatican only seemed to confirm the belief that Hitler and his government might well form an effective partnership with the Catholic Church. After all, both Catholics and Nazis rejected the cultural modernity of the Weimar era, promoted traditional gender roles and forms of family life, opposed Bolshevism, and expressed antipathy towards Jews. Though Catholic religious antisemitism differed from Nazi racial antisemitism, in practice these were mutually reinforcing, as clergy rarely differentiated clearly between the two. Spicer demonstrates how easily clerical attempts to protect the Church from state attacks could lead to accusations of political subversion against Catholic clergy. Indeed, “one-third of Germany’s diocesan priests came into conflict with the Gestapo or other police agencies” (272/357). Few of these would have understood themselves as opponents of the regime. They were merely attempting to fulfill their liturgical, educational, and associational roles. On the side of the laity, over half attended services faithfully and almost all who married within the faith did so in Catholic churches (274/357). By the middle 1930s, however, tensions were rising as Nazis and Catholics sparred over access to Germany’s youth. Hermann Goering forbad all non-spiritual youth activity (including the popular hiking and camping trips taken by church youth groups), in violation of the Concordat. Over time, simultaneous membership in Catholic and Nazi youth groups was forbidden and eventually Catholic youth groups themselves were disbanded, while the Hitler Youth was made mandatory (281/357). Many priests and Catholic religious instructors faced Gestapo investigation or incarceration for their continuing engagement in youth work. Similar battles were fought over the continuing existence of Catholic schools in the Third Reich. Spicer explains how Pope Pius XI and Vatican officials wrote well over 350 pages of correspondence to the German government over various church-state conflicts, following those private complaints with the papal encyclical Mit brennender Sorge (‘With Burning Concern’) in 1937. The German state responded with an increase in the judicial persecution of Catholic clergy by means of the so-called “morality trials,” to which the bishops responded with pastoral letters critical of state attacks on the Church. While the number of Catholics exiting the Church increased somewhat in the later 1930s, all in all, the Church was able to maintain the loyalty of most Catholics and maintain its church taxation system. Finally, during the war, Spicer argues that Catholics were “disturbingly silent” in response to the Kristallnacht Pogrom, with the exception of Monsignor Bernhard Lichtenberg. More notable was Münster Bishop Clemens von Galen’s public protest against the Nazi euthanasia campaign, which “became the central topic of conversation among the Catholics of Münster and far beyond” (287-288/357). In the end, though, Spicer maintains that Catholic resistance was normally limited to blocking state interference with traditional church practices. Similarly, Catholic lay people—perhaps especially in the countryside—were able to accommodate the everyday practice of their faith to their patriotism and loyalty towards the Hitler regime. Finally, Joe Perry’s chapter, “Christmas as Nazi Holiday: Colonising the Christmas Mood,” demonstrates how “Nazi functionaries cast Christmas as a celebration of the German Volk that had deep roots in the solstice worship of pre-Christian Germanic tribes.” Decorations, family celebrations, carol singing, Christmas markets, and Christmas trees “were stripped of their Christian content and were reworked to insert Nazi ideology into popular festivity” (31/357). Perry draws on the history of emotions to assess the extent to which Hitler and his movement successfully co-opted the traditional Christian holiday and the “‘Christmas mood’, which turned on moving feelings of Gemütlichkeit (comfort, cosiness), Innerlichkeit (inner warmth, soulfulness), family love and deeply felt spirituality” (301/357). As Propaganda Minister Joseph Goebbels put it in 1935, Christmas was “the most German of all holidays. It is a Christian celebration,” but “also in the truest sense of the words a National Socialist holiday. Because, when we consider the great ideals of community that bind together the entire German Volk, the commandment ‘love thy neighbour’ has gained a new and surprising significance for us all” (303/357). Perry traces the nazification of Christmas through three stages: (1) attempts to reshape the holiday along völkisch lines in the 1920s, (2) the campaign to popularize the Volksweihnachten (‘People’s Christmas’) between 1933 and 1939, and (3) the promotion of a Kriegsweihnachten (‘War Christmas’) during the Second World War. Often, December 21—winter solstice—was emphasized over December 25 as the time to celebrate, and public celebrations outshone family holidays. An important part of this Nazi colonization of Christmas was the National Socialist People’s Welfare (NS-Volkswohlfahrt) charity initiative carried out by the Winter Relief Agency (Winterhilfswerk). Heavy advertising and aggressive collection campaigns focused on promoting charity because, as Goebbels stated, “we must possess a healthy Volk so that we can assert ourselves in the world” (313/357). The Hitler Youth played a large role in the collection of Winter Relief, giving out badges to those who had donated and shaming those who hadn’t. As “the human face of an inhuman regime” (Herbert Vorländer), the Winter Relief generated large sums of money which went to holiday gift packages and Christmas trees to those in need (314/357). Similarly, other Nazi organizations such as the Hitler Youth, National Socialist Women’s League, and German Labour Front, along with the German Army, also sponsored significant Christmas celebrations. All of these events were designed to celebrate and strengthen the Volksgemeinschaft, or racial community. Perry also mentions the role of the pro-Nazi German Christian Movement in fostering this nazified version of Christmas. German Christians attempted to strip the story of Jesus’ nativity of its “Jewish-Christian accretions.” Indeed, German Christian pastor Wilhelm Bauer’s Celebrations for German Christians (1935) described the rising of a “morning star” on December 25, but left out any mention of Bethlehem, Mary and Joseph, or even Jesus, and renamed Jerusalem “the heavenly abode” (307/357). Nazi party presses produced a wide array of similar publications with instructions for celebrating Christmas, many of them directed to women, boys, and girls. The Ministry of Propaganda also produced many Christmas-themed radio programs and newsreels, while the National Socialist Teachers’ League produced curriculum material emphasizing the “blood and soil” aspects of the holiday, including the winter solstice, Nordic rituals, and female fertility (312/357). Other Nazi writers worked to reshape even family celebrations of Christmas, by emphasizing primordial Germanic Christmas customs and rewriting Christmas carols along völkisch-racial lines. Here too, German Christians played significant roles. They replaced the lyrics “Rejoice, Rejoice, O Christianity” with “Rejoice, rejoice to be the German Type,” and added the lines, “Christmas! Blood and soil awake! Volk, from God’s light and power; your honour and heroism come” to another Christmas song (318/357). During the war, Christmas took on new meaning, linked to suffering and sacrifice. “Light oaths” to the sun, mother love, Hitler, the Fatherland, and the German army mixed with “Bringing Home the Fire,” a ceremony where lit candles would be taken from the public, Nazi celebrations into the family home. More ominously, “Heroes’ Remembrance” ceremonies were designed to comfort grieving families at Christmastime (323/357). Though the nazification of Christmas had its limits—the dechristianization of the holiday was particularly unpopular, and “National Socialist attempts to colonise Christmas and the Christmas mood turned the holiday into a site of cultural-political conflict” (326/357)—Perry effectively demonstrates how it was one means among many through which National Socialists worked to reconstruct social solidarity and national identity along racial lines.